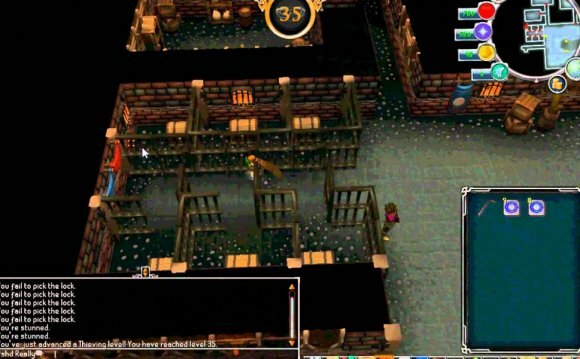 This guide describes the most effective methods to train the Thieving skill. The experience rate estimates in this guide do not incorporate the use of any experience boosting items or bonus experience. Thieving is a support skill which involves using techniques such as pickpocketing, coshing and lock picking to steal items and to gain access to restricted areas. As players level up the Thieving skill they gain the ability to steal from NPCs and scenery objects which award greater amounts of experience when they are successfully stolen from. Levelling up Thieving also decreases player's chance of failing Thieving activities where there is a chance of being unsuccessful. Different tiers of Ardougne cloak are awarded on completion of the easy, medium, hard and elite sets of Ardougne tasks. While an Ardougne cloak 3 or 4 is worn it increases the player's chance of success when pickpocketing NPCs anywhere in RuneScape. Gloves of silence increase players' success rate while pickpocketing by 5% while they are equipped. A Hunter level of at least 54 is needed in order to wear the gloves. Gloves of silence can be bought from the Grand Exchange for 1, 327 each or created at the Fancy Clothes Store in Varrock from 2 dark kebbit furs for a cost of 600. Gloves of silence are damaged each time that the player is unsuccessful in a pickpocketing attempt and they are destroyed after 62 failures, if counted from when they are new. If a player has multiple gloves of silence then they will all display the same status when their condition is checked. However, if the gloves of silence currently being used do fall apart, then any other pairs that the player owns are reset to the "new" condition. The condition of the gloves is only relevant to the player owning them, and is not a property of the gloves themselves. Players with at least level 64 Crafting can restore their gloves of silence to "new" condition by using 1 dark kebbit fur, costing 54, and thread, costing 9, on the gloves. Wearing components of the black ibis outfit gives a percentage increase in the amount of base experience that is gained while thieving. There are four pieces in the set: the mask, body, legs, and boots. Items from the outfit can very rarely be found while looting urns and sarcophagi within the Pyramid Plunder minigame. The chance of finding a piece of the black ibis outfit is increased if the player is wielding a sceptre of the gods. The sceptre of the gods is obtained as a rare reward from looting the engraved sarcophagus in the final room of the minigame. The engraved sarcophagus requires level 91 Thieving to access and level 75 Runecrafting to open. If all pieces of the outfit are worn, then an additional set bonus effect is given. 25% chance of avoiding being stunned and damaged following an unsuccessful pickpocketing attempt. 25% chance of avoiding being bitten by a snake during an unsuccessful attempt to loot an urn at Pyramid Plunder. If the player owns pieces of the black ibis outfit, then they will receive their increased base experience effects while wearing the exoskeleton set. If the player has at least level 75 Thieving and level 75 Hunter, then they will gain a 5% increased chance of success when pickpocketing with the exoskeleton bracers equipped (this effect is equivalent to that given by equipping gloves of silence, so it is recommended that players use the bracers instead of gloves of silence if they are able to do so). There are 2 Summoning familiars available which can be used to give a temporary visible boost to a player's Thieving level if their special move scroll is used while they are summoned. This can be used to allow the player to access content which they do not currently have the required level for as well as giving a slight improvement in thieving success rate. Five-finger discount auras increase a player's chance of thieving successfully by a fixed percentage while they are activated. These auras' effects last for one hour after they are activated. Players may use 5 or 10 vis wax to extend a five-finger discount aura's activation time by 50% or 100% (costing 34, 995 or 69, 990). This effect must be applied before the aura is activated. Once a five finger discount aura has been used the player must wait 3 hours before using it again. Five-finger discount auras can be bought using Membership loyalty points. All lower tiers of the aura must be owned before a higher tier aura can be purchased. nickdefusco8 Runescape Money Making Guide 2 - Thieving!